Opioid addiction treatment with Health Care Resource Centers (HCRC) includes counseling as an essential part of a patient’s treatment plan. Decades of research show that medication-assisted treatment (MAT) is most effective in conjunction with professional counseling and support. We provide counseling services for methadone and buprenorphine MAT programs. HCRC counselors are trained, certified professionals experienced in the field of addiction treatment. They offer non-judgmental, compassionate support to our patients throughout their recovery. Counseling is goal-oriented, driven by each patient’s objectives for their recovery and life outside of their disease. Substance use disorder counseling is also a legal requirement of participation in many MAT programs. We provide counseling as part of a comprehensive treatment service. Modifying patient’s thoughts and behaviors toward opioids and other mind-altering substances. Teaching tools and coping strategies to effectively handle stressful situations and difficulties encountered in life. Educating patients on the science of addiction and relapse prevention. Creating a safe place to talk about past traumas, family issues and other problems that have affected a patient emotionally, psychologically or spiritually. Building strategies for reconnecting and healing relationships with family and friends. Offering guidance on becoming a productive member of the workforce and community. Sharing experiences and solutions provide patients with the opportunity to learn new tools and strategies for problem-solving from others in recovery. Feelings of guilt and shame are reduced as patients realize that others have had similar experiences in and out of addiction. Patients are able to provide support and hold one another accountable to their individual and group treatment goals. Building a support network of family, friends and others in recovery gives a patient the support they need to achieve recovery. 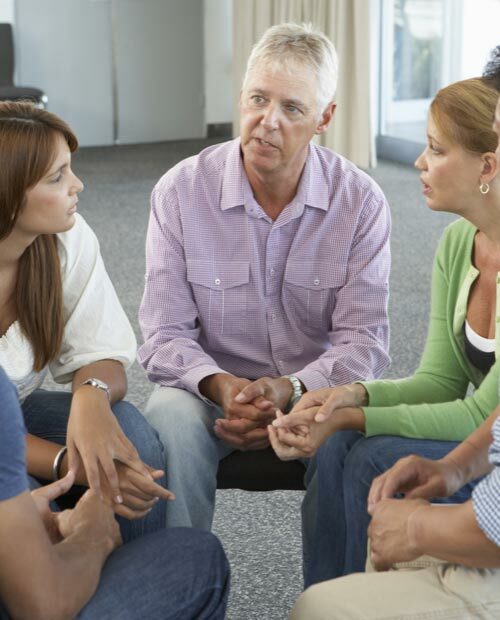 In addition to HCRC in-house counseling groups, patients are encouraged to participate in programs such as Alcoholics Anonymous, Narcotics Anonymous or any other medication-assisted friendly group utilizing self-help principles to guide recovery. Helping patients rebuild their relationships with their loved ones. Teaching families about enabling behaviors and helping them avoid these actions. Raising the patient’s awareness of their behaviors’ effect on others. Enhancing the overall well-being of the patient and their family. Like individual and group counseling, the goals will be specific to each patient and family, but will focus on rebuilding healthy relationships. Broadening the patient’s support system: A counselor serves as a confidante for a person with an opioid addiction. They listen to the patient’s thoughts and feelings and help them make sense of their behaviors. Counselors aim to create a comfortable environment where the patient can discuss any aspect of their recovery. When the patient and counselor begin to work together, they’ll build this trust over time. The counselor becomes an important part of the patient’s support network. Addressing potential underlying causes: Trauma and undiagnosed mental illness can influence addiction without the patient realizing it. The patient uses their opioid of choice to relieve behavioral symptoms like depression and anxiety. A licensed counselor can refer the patient to mental health services and address the dual diagnoses of addiction and mental illness. They can also help the patient pinpoint stressors that trigger the urge to use opioids. Including treatment in every aspect of life: Methadone and buprenorphine allow the patient to live life without withdrawal symptoms and cravings. However, just as multiple factors contribute to addiction, many aspects influence recovery. The patient will experience stressful situations and the obstacles that come with treatment. When they don’t know how to handle these events, they could face mental distress or relapse. Counseling teaches a patient coping skills that they can use when faced with a situation that might have previously given them the urge to use. Encouraging recovery and change: Addiction counselors want to see their patients have a successful recovery. Recovering from an opioid use disorder brings many obstacles, making some patients feel unmotivated or overwhelmed. The counselor understands the issues a patient goes through and tries to motivate them to stay committed to their recovery. Change is up to the patient, but a counselor can give them the motivation needed to move one step further towards a better life. HCRC provides counseling for opioid treatment in Connecticut, Maine, Massachusetts and New Hampshire. We offer individual counseling at every New England location and group and family counseling at select offices. Our MAT services include methadone and buprenorphine maintenance treatment that can reduce your withdrawal symptoms and help you recover. When you count on us to guide your journey to recovery, we take a personalized approach. Every patient receives an individualized treatment plan that takes their health and experiences into account. We understand that no two patients are alike — they all need specific, dedicated care to succeed. Let us help you — fill out the contact form below or call 866.758.7769.